These little plumpy morsels in their recognizable shell shape may have originated from France, but its fan base spans the globe. I read that some had said, for the tastiest and most delicately authentic madeleines, one needs to go to France. Hmm...sounds like a darn good idea to me! The first time I tried making madeleines was well, not quite in their original form as I didn't have any madeleine pans then so I basically used my bear mould pan. I had used the recipe from Lee Mei of Cooking Hut, who shared a classic recipe which uses yeast instead of baking powder. Last week after purchasing my madeleine pans, I got eager and wanted to make some badly. After searching and comparing about 5-6 recipes (and they all have the same classic ingredients), I stumbled upon one which uses some milk and honey. The result was good if you want crusty edges with a buttery moist inside. These are however, best eaten on the same day they are baked as leaving a day older will have them less spongy. Put racks in upper and lower thirds of oven and preheat oven to 350°F. Brush molds with melted butter. Sift together flour and baking powder into a large bowl, then whisk in zest. Scrape seeds from vanilla bean into another bowl with tip of a paring knife (reserve pod for another use). Add sugar and rub together until vanilla is well dispersed, then whisk in eggs, milk, honey, and remaining 1 3/4 sticks melted butter. Fold into flour mixture until just combined. Turn out madeleines onto a rack and serve slightly warm. Notes: These madeleines are best eaten when just baked. The batter can be made 3 hours ahead, then chilled, covered. I love the crusty outside and moist inside kind of little cake... just like those kampung style bahulu! ^_^ Thanks for sharing, Jos. And spending your valueable time with us. Have a great evening. The Madeleine craze has definitely seized many lately :) ... Your madeleines look plump and golden! Yours look perfect! They have the little bumps that everyone's after. Your madeleines are very pretty! Great job! I love it! This is a hot item in blog now. Too bad, I don't have the mould yet. Lovely and golden! Great for a coffee break! 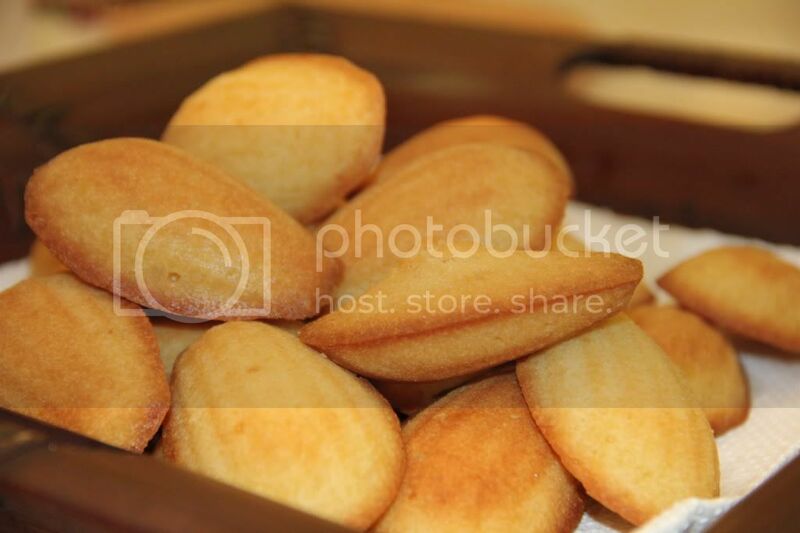 Whenever I saw madeleines, I wish I could have bought the pan...sighs...really have to get one before X'mas. These look so lovely and nicely baked to a golden colour. I love the golden color of these madeleines, I am so tempting to get the mould now. I agree, its just not the same without the madeleine pan. I love madeleines when they are warm and fresh from the oven. THese look delicious! I love the idea of using honey!! Well done, your madeleines look great! Will have to look for madeleines pans, TWY would love this! look fluffy and moist !! why you guys make pretty madeleines?? *crying* mine usually have bruise! lol! Hey, madeleines are one of my mom's and my fave snacks! I betcha got ur pan at Phoon Huat, eh? I got mine there, too. WOW!! !...a lovely golden brown and it looks so tempting i feel like biting into one right now......!!!!!! Love it, it's the best and simply delicious. That is Madeleine! Your madeleines look so good.